Your loved one is safely in our care. You are giving your loved one the best chance to find recovery. At Oxford Treatment Center, our clinical team will apply research-based approaches and decades of experience to help your loved one start a new life in recovery. We encourage you to trust our team’s care and guidance. Recovery is a long journey, and this is just the beginning. Addiction does not have a quick fix. Research has shown that most addicted individuals need at least 3 months in treatment to significantly reduce or stop their drug use, and that the best outcomes occur with longer durations of treatment. Your recovery matters, too. Families suffer greatly when they have a loved one in addiction. You deserve to find health and wholeness just as much as your loved one does. We encourage you to seek support and to focus on your own rest and renewal while your loved one is in treatment. Find an Al-Anon or Nar-Anon meeting near you. Oxford Treatment Center provides a 72-hour blackout in communication when patients first enter our facility. This gives your loved one a chance to adjust to their treatment environment with support from our experienced medical and clinical staff. Your loved one’s daily routine will depend heavily on their customized treatment plan. However, if the patient consents, our therapists will routinely reach out you and any other family to keep you updated on your loved one’s progress. Generally, you can expect your loved one to receive daily group, experiential, and recreational therapies, as well as a minimum of one-hour of individual therapy a week. They will also be given any needed medications after every meal and before bed. 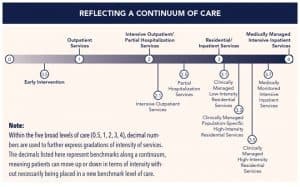 Starting on day one, your loved one will also be working to craft an aftercare plan with their treatment team so that both you and they will be prepared when they come home. After the 72-hour blackout period, your loved one will be able to reach out to contact you during their free time, whether this be through facility phones or their own phones. Due to our structured treatment schedule, we cannot bring your loved one to the phone if you call. We will be glad to deliver a message for you. You may send mail to your loved one. 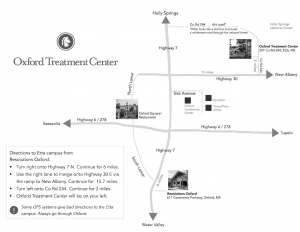 If it reaches us after your loved one has left Oxford Treatment Center, we will return it. What if I Don’t Hear? Not hearing from a loved one, especially during that 72-blackout period, can be alarming, but all the staff here at Oxford are dedicated to your peace of mind. You may bring gifts; however, any gift brought to the facility must be checked by staff, especially if it is medical in nature. Any toiletries or tobacco products must be unopened. Please do not bring food, beverages, or any unopened products. All products are subject to search by Oxford staff. Did you check that mouthwash label for alcohol? For the protection of our patients and their sobriety, we will search all bags and packages brought onto our campus. Some common items that are not allowed are outside food or drinks, energy drinks, and anything containing alcohol (including toiletry products). Visit the Admissions page for a complete list of what you may bring or send to your loved one. 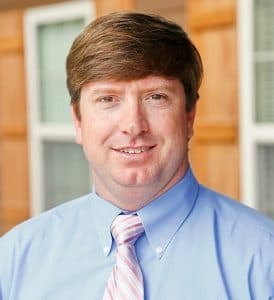 If the patient and their therapist agree it may be conducive to recovery, you may be able to participate in Oxford’s 2-day intensive family therapy program. As part of the program, you will attend various lecture series, ranging from the importance of family in recovery to the role families can have in healing addiction. Whether you’re participating in the family therapy program or not, all family are invited and encouraged to visit their loved ones on Sunday afternoons, provided your loved one has passed their 72-hour blackout period. You’ll be able to meet your loved one on our scenic grounds rom 1 to 4 every Sunday afternoon. Speak with them, walk around, or just relax and enjoy each other’s company. Memphis is the closest international airport, and is located about an hour and a half away. Oxford is a college town and the hotels tend to be fairly busy. If you’re unable to find lodging in Oxford, we recommend searching in New Albany. If you are able ­— and if it is clinically appropriate for your loved one — we encourage you to join us for family visitation each Sunday from 1-4 p.m. Family members and significant others are allowed to visit after a patient has completed detox or has been admitted for 72 hours. Absolutely no cell phones are allowed. Leave your phone in your car, and lock your car as soon as you arrive. Leave all purses and bags locked in your vehicle as well. When you arrive, you must sign in at the reception desk and get a visitor nametag. Everything you are bringing to your loved one must be brought to the staff when you arrive and will be searched. Any medication brought in for your loved one must be taken to the nurses’ station immediately — including all over-the-counter medicines. Smoking is allowed at our facility in designated areas. 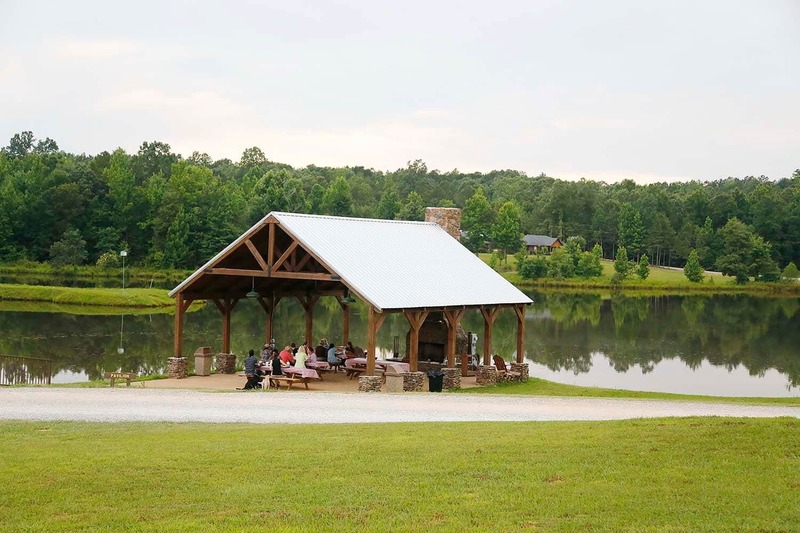 The designated smoking area for visitors is the lakeside pavilion. You are invited to visit with your loved one in and around the Main Lodge and at Pavilion 1. Use this time to focus on your loved one rather than exploring our facility. Visitors are not allowed in patient cabins. We take seriously our responsibility for each and every patient in our care. For that reason, any visitor that is not able to follow these guidelines will be asked to leave immediately. Additionally, Oxford Treatment Center will legally prosecute anyone involved in bringing alcohol or illicit drugs into our facility. Don’t get lost in the woods! Some GPS systems give bad directions to our campus, especially when coming from Memphis. Your GPS may say it’s a shortcut — but it’s actually a 12-mile trek down dirt roads through the uninhabited Holly Springs National Forest. Always go through Oxford or New Albany to reach our campus via Highway 30. 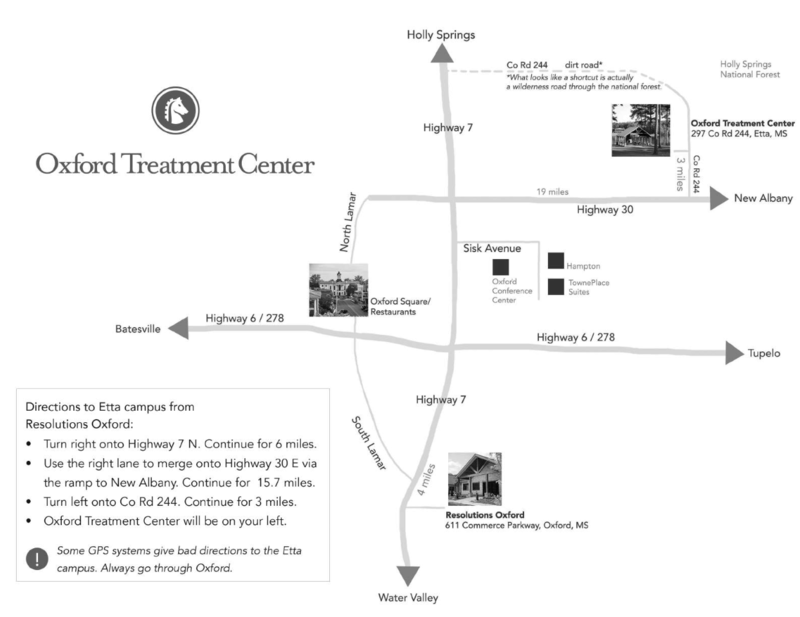 Download and print this map for directions to both our Etta and Oxford Resolutions facilities. Do not be surprised if your loved one wants to leave early, especially as he or she is settling into his or her treatment environment. Resistance to treatment is very common, especially among young adult patients. Our work in therapy includes a range of strategies for helping patients find motivation to engage in treatment. After completing detox, your loved one may begin to feel a lot better. You may see them looking much more healthy. It’s easy to think the problem is solved. What’s not visible is the far slower process of rewiring that must take place in the brain. It is very common for clients to encounter roadblocks in the process that can contribute to them wanting to leave treatment early or leave Against Medical Advice (AMA). If your loved one pressures you to bring him or her home Against Medical Advice, encourage them to remain in treatment and get the help they need. Let your loved one’s therapist know right away, so that the treatment team can provide support and intervention. We all want to see your loved one succeed in recovery — not just for a few days but for the rest of their life. Remember, your loved one will be going through many emotions as they begin their recovery. Symptoms such as physical or emotional discomfort, difficulty concentrating, mood swings, anger, and insomnia are normal. Continue to encourage your loved one that they are doing the right thing by staying in treatment and getting the help they need. 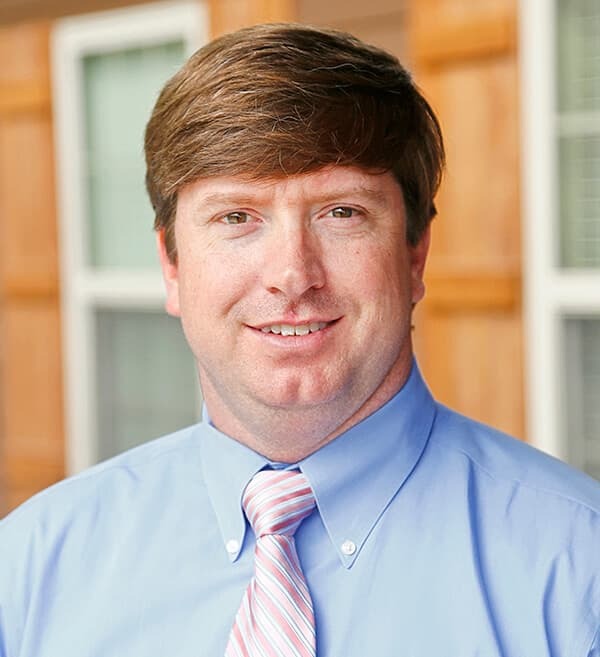 Oxford Treatment Center follows research-based guidelines by the American Society of Addiction Medicine (ASAM). ASAM breaks down drug and alcohol problems into five different levels, and even more sub-levels in between. 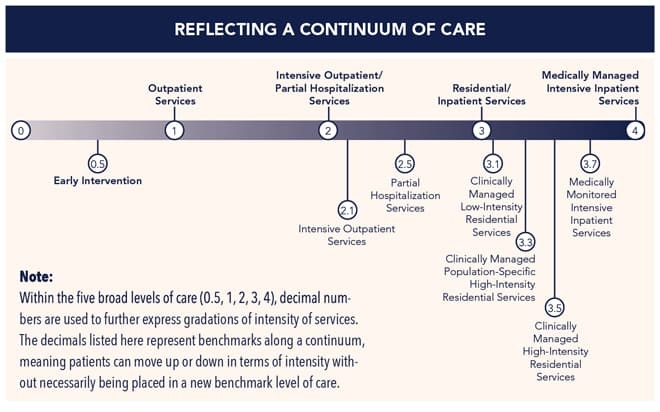 The goal in treatment is to see an individual to move down that scale, from needing intensive medical management to needing just outpatient care and maintenance. Clinical programs should apply the right amount of therapy and support at each step. From ASAM: What is the ASAM Criteria? How long the process takes depends on each patient’s situation, said Dr. Stephen Pannel, psychiatrist and medical director. Getting a loved one into treatment is a tremendous step toward recovery. While a brief detox or a traditional 28-day treatment can be beneficial, research has shown that treatment for at least 90 days leads to a far better chance of long-term recovery. 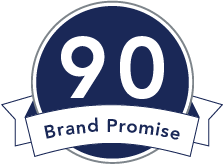 American Addiction Centers offers a 90-Day Brand Promise. If your loved one completes 90 days of treatment with Oxford Treatment Center or another AAC facility — then relapses — he or she can come back to treatment for an additional 30 days at no charge. AAC is the only major treatment provider to offer such a promise.